Hi, friends! I hope you all had a wonderful weekend and sweet Easter. We had family in town early in the weekend and then spent a quiet Easter day at home. It was sunny and warm in Chicago and pretty much perfect. Also, I’ve gotta give a special shout out to The Mister who is in Boston to run the marathon today. YAY! Go, babe! Super honest moment alert: I’m 10 weeks postpartum and still struggling with how to dress my postpartum body. Most of my closet still doesn’t fit quite right, and don’t even get me started on my jeans. When I first saw myself in these photos, I cringed a little inside. I’m just not used to seeing that extra weight. So, to anyone else who is right there with me, overjoyed when you look at your sweet baby, but frustrated when you look at that damn scale, I get it. Totally. Moving on… We already know I’m total sucker for stripes. When I spotted this two piece set from ASOS, I was smitten. It’s got that laid back, easy vibe that I love, but can also be dressed up with these adorable heels and this clutch. These sunnies have quickly become one of my spring style staples. I’ve been wearing them every single day. They are low in stock, but here is a very similar pair. They add some chic to any outfit, which is very appreciated by this stay at home mama. 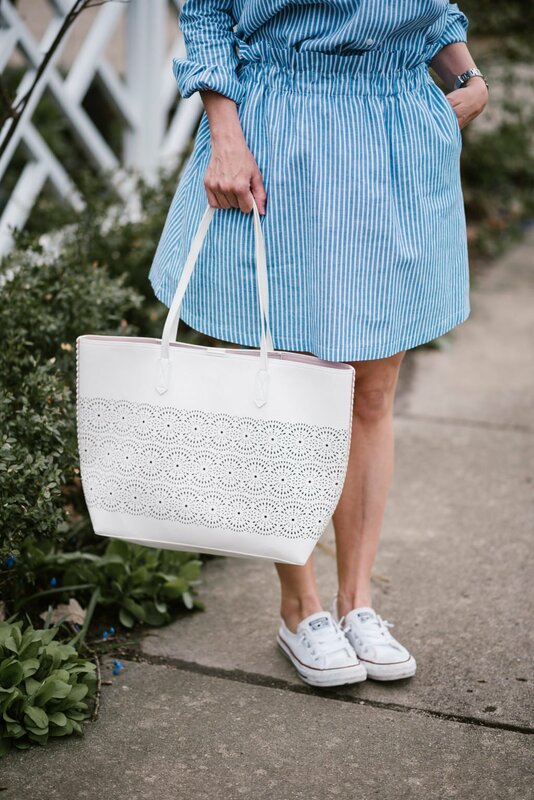 And how cute is this tote for spring and summer?! It comes in tan, too, and is on sale for $20. WHAT?! How on earth. So good. Thank you! I work with an awesome photographer – Iron + Honey. So good! That dress looks amazing on you there is no way you had a baby 10 weeks ago you look amazing! 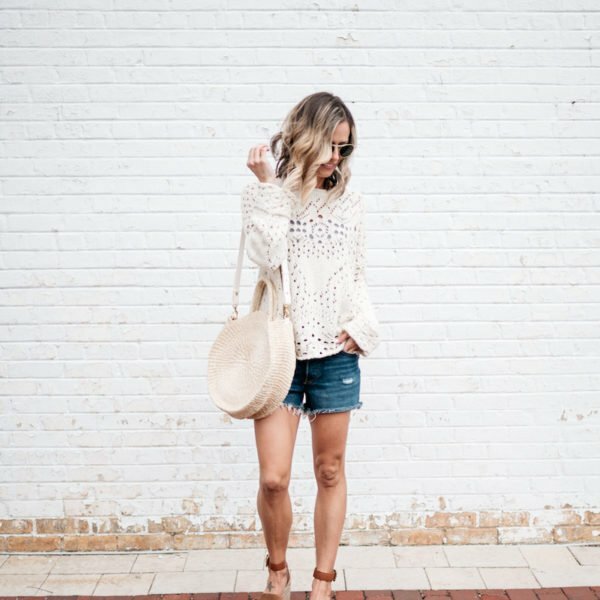 Such a great outfit for spring and for day time running around when you want to look cute! That bag is fantastic too! This is the perfect postpartum dress. I know we are our worst critics but it’s hiding any sign that you recently had a baby. You look so beautiful in that dress! It’s such a perfect outfit for spring. Cute look, I love the vertical stripes for elongating the body! Girl, you look amazing!! I hope I look like that after a baby 🙂 And CUUTE outfit. Loving the stripes and shoes! So sweet – thank you, Rebecca! Love the dress! Best of luck to hubby in Boston. A dream race, that I might be able to qualify for if I can still run at 90, LOL!!! Easy affordable + ADORABLE! 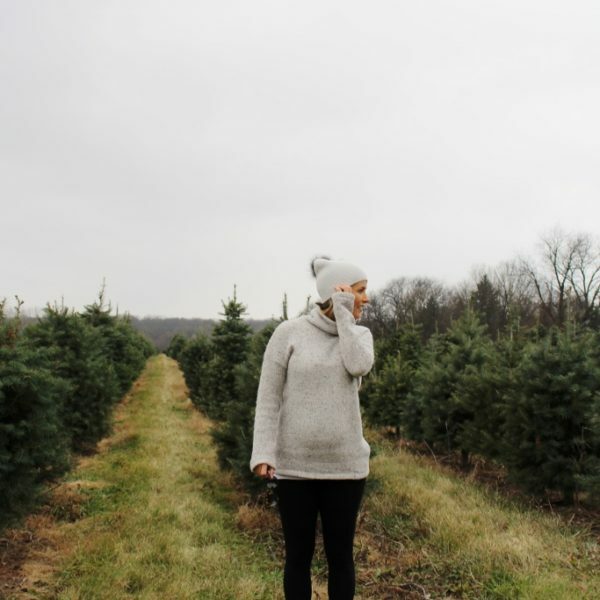 i love this so much i’m going to follow you on bloglovin! Super cute, girly!! I’m living in those shoes right now!! I love this dress! So darling and casual. I need it right now.